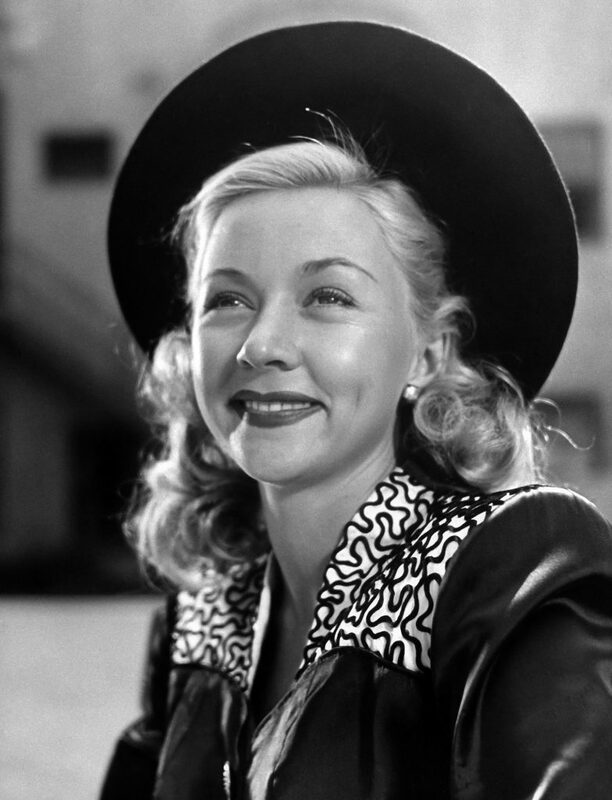 In another installment of her column Dame in the Game, Maureen Lee Lenker places the spotlight on Gloria Grahame, a misunderstood woman who fought for her career. Gloria Grahame may not seem to fit alongside the women we typically feature in this column — she didn’t found her own company, become a director, break any particular barriers, or do significant philanthropic work. But Grahame merits a place in the “Dame in the Game” oeuvre merely for the roles she played onscreen and her lifelong determination to put her career and desires first. Sadly, Grahame’s life is not incredibly well documented — the last significant biography written about her was published in 1989 and is now out of print (and it’s dripping with casual sexism). Chroniclers of her life have focused more on her proclivity for plastic surgery and her scandalous love triangle with husband Nicholas Ray and stepson Anthony Ray than her work ethic and immense talents as an actress. First put on contract at MGM in 1944 as a sultry blonde type, she gained widespread attention in 1946 for her role as Violet Bick in It’s a Wonderful Life. Throughout her career, studios struggled to figure out what to do with her bold screen persona that often did not fit within the confines of a studio mold — she hit her stride in the 1950s with a series of noirs in which she played a range of shadowy characters and brassy molls. Grahame deserves a far better biography than merely this column, but including her as a “Dame in the Game” is at least a start. 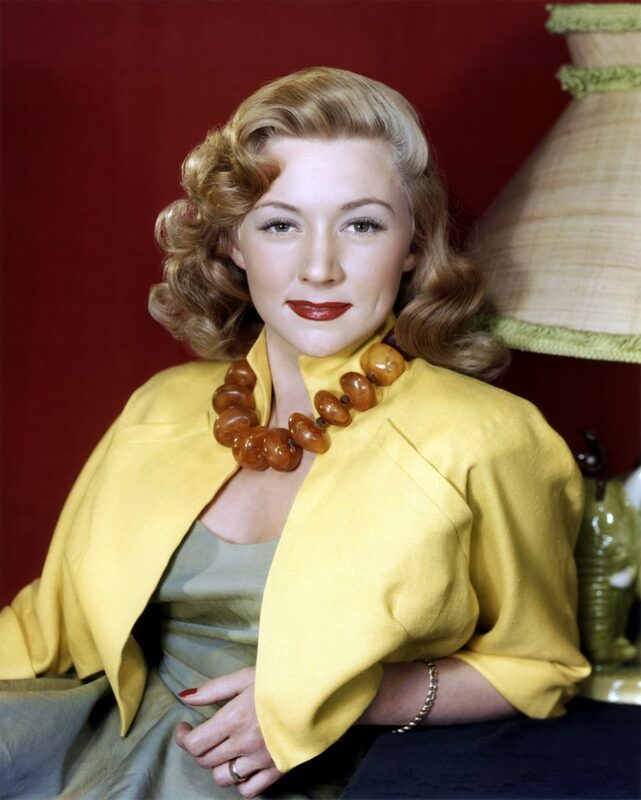 Gloria Grahame was born Gloria Grahame Hallward on November 28, 1923. With an acting teacher/actress for a mother and growing up in Hollywood, Grahame showed an early interest in acting. Grahame’s mother Jean directed productions at the Pasadena Playhouse where Grahame appeared in plays from the age of nine. There, under her mother’s teachings, she learned a skill that was foreign to many studio actors of her era — research. Popularized with the Method teachings of the mid-century, Grahame proved herself an insatiable actor from a young age, researching a role from top to bottom. Throughout her career, she visited libraries to study past productions to learn about the history of how a role was played including blocking and costume sketches. More importantly, she painstakingly researched the circumstances of each character she played, even cornering people in public to learn more about their lives, their speech patterns, or even their gait. In the early 1940s, Grahame got her start on stage, appearing in local Los Angeles productions as well as joining several touring shows. She was renowned for her work ethic, using her lunch breaks to study her scripts, try out new lines and business, and more. Establishing this mode of working from a young age, Grahame was a consummate professional on sets, using every spare moment to rehearse and perfect a role. Onscreen, Grahame excelled in roles that relied on her specific mystique — a blend of sexuality, warmth, and existential ennui. It was far from her real personality and a characterization she perfected from her early days spent in constant study and rehearsal. Louis B. Mayer signed Grahame to a contract at MGM in 1944 after seeing her on Broadway. She made her screen debut in Blonde Fever, but did not really capture audiences attention until 1946’s It’s a Wonderful Life. Though Donna Reed gets all the love for her romantic turn opposite Jimmy Stewart, Grahame gave a heartbreaking and nuanced performance as Violet Bick, a flirtatious woman who Stewart’s George Bailey saves from a life of disgrace. MGM did not know what to do with Grahame’s more sultry, earthy talents, and they signed her over to RKO in 1947. There, she earned her first Oscar nomination for her work in Crossfire as a potential witness to an Anti-Semitic murder. 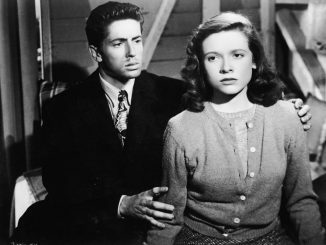 Though a B-picture, it placed Grahame in what would become her niche — the shadowy world of film noir. She earned raves for her performance, which many felt brought vulnerability, poignancy, and truth to an otherwise cheap and sour world. The film itself was highly regarded for its willingness to tackle the issue of anti-semitism and hate crimes. In 1950, Gloria joined a rising trend and severed her ties with RKO, choosing to work as a freelance actress for the remainder of her career. She decided to make a go as an independent artist because she felt the dealings of the studios had caused her to miss out on to many great roles (namely Judy Holliday’s role in Born Yesterday and Shelley Winters’ part in A Place in the Sun). The decision was one of the wisest she ever made as the next five years brought her the most memorable roles of her career, including parts in The Bad and the Beautiful, Sudden Fear, and The Big Heat. She entered a period of her career where she topped box office polls, increased her salary, and became the first actress to accept an Academy Award on national television. First up was Grahame’s most memorable and personal performance — the role of Laurel Gray in In a Lonely Place. The film was directed by Grahame’s husband Nicholas Ray as their marriage was beginning to fall apart — their tensions and fights began to play themselves out onscreen. Grahame’s character is the next-door neighbor to the violent and temperamental Dixon Steele (Humphrey Bogart), a man she clears of murder but then begins to doubt. Grahame delivers a performance seeping with anxiety and desire, helping to create a film with a palpable sense of claustrophobia and dread. Next was The Greatest Show on Earth, which Grahame jumped at for the chance to work with Cecil B. DeMille. Grahame stepped into a role when a very pregnant Lucille Ball was forced to bow out. As Angel, the elephant girl in the circus, Gloria had to develop a working relationship with the elephant in the film and learn her how to do her own tricks, including allowing the elephant to place its foot on her face. Grahame was also known for being occasionally difficult to work with — directors found that she simply often did not like to take direction. If Grahame had already worked out what she felt was the best way to do something (or studied it with her acting teacher mother at home), she would not budge. The press also had a trying relationship with her, but primarily because Grahame refused to play the game of the Hollywood publicity machine. She valued her privacy and often just couldn’t be bothered. There are many that would earn the moniker “difficult” or “diva” for such behavior, but Grahame frankly did not. It’s hard to say if it was because she was so easy going in other ways or if because her choices were often spot on. By all accounts, Grahame was committed to understanding her role, the film overall, and the process of filmmaking as thoroughly as possible. She would often ask questions on set, seeking to know how a camera or lighting set-up worked. Colleagues described her obsession with discussing her roles, trying to pick apart the intent of each small detail in a given scene. All of this resulted in an ability to play scenes very naturally once on set. Directors often praised her for “knowing her shots” and her ability to flawlessly execute challenging tracking shots in one take. With her roles in The Big Heat, Sudden Fear, In a Lonely Place, and more, she crafted a distinct and unique persona — a blousy, vulnerable, earthy, sensual woman. Grahame, with her peroxide blonde hair, perfected a brand of 1950s film noir femininity — an unrestrained figure with a wounded air. It’s not that her characters should be described as fully-fledged feminist icons — they are far from it. But she does display a different, more wild type of woman that defies the expectations of 1950s domesticity. Grahame wasn’t obsessed with looking like a glamour girl, but rather she imbued her characters with a naturalistic, raw, sensuality that felt an authentic part of the worlds she inhabited. She inherently understood this aspect of her fame and talent, saying in an interview with Silver Screen, “I dote on death scenes, or any kind of Spillane-type manhandling, because it is those scenes which linger in an audience’s memory. I don’t want to be typed as a woman with a face nice enough to look at, but I am interested in roles that sometimes turn a cinema-goer away in horror. So I didn’t mind having my face horribly scarred because my gangster boyfriend threw a pot of boiling coffee over me. Being glamorous in movie roles all the time is not only artificial but horribly monotonous . . . So far, no one has offered me the role of the Hunchback of the Notre Dame. Believe me, I’m the girl who would play it.” In short, she valued juicy roles over vanity. She largely concluded the most visible part of her career in Hollywood with a role rather out of character for her — Ado Annie, the over-sexed farm girl in the big-screen adaptation of Rodgers and Hammerstein’s Oklahoma. She did not particularly enjoy the experience as she was not a gifted singer or dancer. Though Grahame’s career slowed at times and she actually did pursue domestic life with Tony Ray, she acted until the end. Even when faced with a terminal cancer diagnosis, she continued to act right up until she passed away. Though she worked throughout her life, she had two periods of extraordinary output–between 1951 and 1955, she made more than a dozen films and then, near the end of her life, between 1978 and 1980, she made three films and appeared in four plays, a television movie, and a TV show. In her early days, she had set out to become a dedicated actress. In the last few years of her life, she finally made good on that deal for herself in her own mind, performing Shakespeare and classical theatre. Grahame died of stomach cancer when she was only 57 in October 1981. Great article on my favourite Film Noir actress. 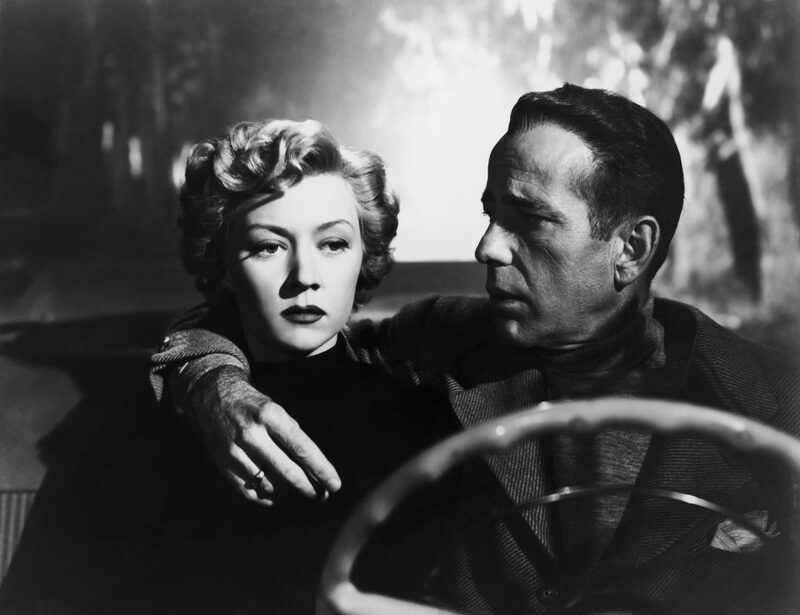 Her performance in the much overlooked In A Lonely Place is breathtaking, as is Bogie’s. Thanks for highlighting Gloria’s story.